Cortec Cor-Pak Stretch Film is the ultimate high performance film developed for corrosion protection of ferrous and non-ferrous metals. This film is coextruded using state-of-the-art resins, which offer superior strength and stretch characteristics as well as multimetal corrosion inhibiting properties that only VpCI technology can deliver. Cor-Pak VpCI Stretch Film delivers puncture resistance and load holding, which allows a user to down-gauge, contain aggressive loads and produce a better package at reduced cost. 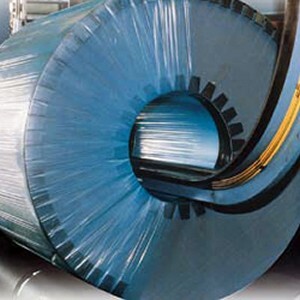 The combination of enhanced polyethylene resins with VpCI technology makes CorPak VCI Stretch Film the most advanced corrosion inhibiting stretch film available on the market today. Cor-Pak VpCI Stretch Film is compatible with commercially available manual and automatic stretch wrapping equipment. Available in standard machine film size and gauges. Contact us (877-256-9301) for inquiries and custom requirements. Cor-Pak VpCI Stretch Film should be stored indoors at room temperature, sealed in its original packaging.